Introducing lxkey|eos, a high quality keyboard designed for use with the ETC Nomad lighting platform. Ideal for nomadic lighting designers, lxkey reproduces the layout of the consoles you already know and love. lxkey|eos was designed by a regular Nomad user searching for a durable, affordable alternative to other solutions, but that would still fit alongside a laptop in a carry-on bag. By faithfully recreating the key layout you're already familiar with as closely as possible lxkey|eos makes using Nomad easier and faster, allowing you to concentrate on what matters most — the lights. The lxkey|eos is designed to closely emulate the ETC consoles you know and love. Coloured keys are used to group familiar functions whilst remaining compact. The lxkey range of keyboards use Cherry MX mechanical keys with ergonomic tactile feedback intended to withstand intensive use, very similar to the console itself. 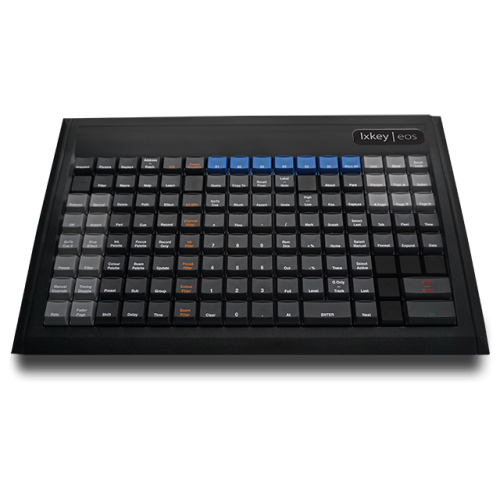 The lxkey keyboards have an internal USB hub, ideal for your Nomad software protection dongle, and facilitates use of a USB LED gooseneck lamp. ETC Lighting Control wherever you areSmall enough to fit on your keychain, Nomad plugs i.. ETC Lighting Control wherever you areThe ETCnomad Puck is essentially an ETC lighting co..